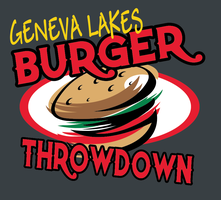 The 4th Annual Geneva Lakes Burger Throwdown will be held at Geneva Ridge Resort, Sunday April 12th 2015, from 12n to 3pm. This is a wonderful event that benefits the Badger ProStart Culinary Program. Which is great training for young local culinary minds. The event has seen much success in its’ first three years with over 1,000 attendees last year. Last year Chef Ben Janssen from Abbey Springs swept the podium, winning both the peoples’ and the judges’ choice awards. Chef Justin was a part of that team and is looking to go back this year and compete against his old club. We would encourage you all to go check out the event and show your support for our club and its’ new Chef. Chef Justin raised funds for the event by going to local businesses and getting them to donate their products. The local sponsors for our club are Lake Geneva Spice Co., Daniels Sentry Foods, River Valley Kitchens, and Gordons Food Service. Chef Justin will be preparing an Asian theme burger with a tasty twist. Tickets for the event can be purchased HERE. But buy soon because there is a limited number available. Come get your first taste of our clubs’ new flavors! Have a great day everyone!